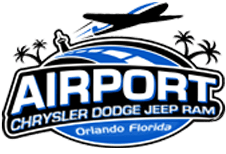 At Airport Chrysler Dodge Jeep in Orlando we pride ourselves on providing our customers with a great selection of vehicles, the lowest possible prices and the best car buying experience available. As customers come to us from all over the state and the country they share with us the experiences that they've had at other dealerships. We thought we would share these with you in order to help you save time and aggravation. Here are some of the scams and tricks that other dealers are using to get you in the door. This Dealer adds "options" to the MSRP of the vehicle. Okay, so dealers installed options could be window tint, wheel locks, pin stripes and maybe a bedliner on a truck, but what are they adding to a $30,335 car that would cost $1,599? Seems to me like they've found a new way to show you that big savings amount on their internet price. Hey, at least they look like they are using rebates everyone qualifies for, right? I think we find out the real story below. WRONG!!! Take a look at their disclosure in the following image. Must qualify for all rebates? So much for straight forward approach. But what a minute! Dealer installed options are in addition to the advertised price??? Didn't they already add options to the MSRP? To top it off, they take the timeshare approach to get you in the door, sit through a presentation and get a free gift. Is it worth the headache? This Dealer deceives your eye by having the MSRP in bold black letters but then saying Dealer List in light gray. Which one is it? The MSRP on the window sticker of this car is $30,335. Hold on a second.... I'm only getting $354 discount off the sticker? That's exactly why you have to beware of Dealer set pricing. Another case of raising the MSRP to show you a bigger discount. And what about their disclosure? I have to make an appointment? If the price is posted, why do I have to make an appointment? The Lifetime Warranty also has a lot of fine print to be beware of and not every vehicle is covered. But wait, "Internet Price is a cash price." Who has that much cash laying around? Most people finance their vehicle, so not only do they only give you a few hundred off the MSRP if you pay cash, it looks like they'll try to get more than the sticker price if you are financing! DSRP- We've all heard an MSRP, but DSRP? Why would anyone believe the Dealer's Suggested Retail Price? Yet another way to make the customer believe they are receiving a larger discount than they really are. This dealer, for example says we are saving $9,121 on this car. Let's take a closer look. They tell us the DSRP of the car is $38,070, but after pulling the window sticker the MSRP is only $36,175. There is $1,895 of implied savings. Scroll down to see even more about this internet price. They tell you the "sale price includes all rebates" and you "may require lease return." Also be leery of dealer installed options being additional, which you will see in the next example. 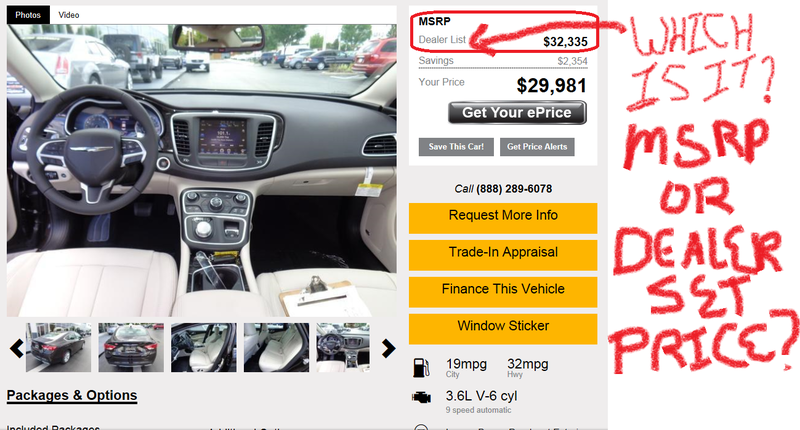 Dealer Installed Options and Owner Loyalty- The dealership in this next example tells you that they have not included the options they have installed on the vehicle in their pricing. What are these options and how much are they? We don't really know, they show you at the dealership and price them at time of negotiation. Chrysler discloses all of their rebates on their websites including when they offer owner loyalty discounts. Our customers tell us their explanation is if you have not purchased from them before, the customer does not qualify for the dealership loyalty program, this has nothing to do with an owner loyalty! Before you assume they are not like Dealer #1, take a look at the underlined disclosure. C'mon, really? Not only do they say you need to "confirm the details" to see "what factory rebates you may or may not qualify for," they also tell you the "Dealer can not be held liable for the data that is listed incorrectly." Doesn't that mean they can say the pricing is a mistake? After all, they "can not be held liable." What are we to believe? You also need to be aware when shopping for pre-owned vehicles as well! The posted price is $24,900, but you have to add $2,000, and that $750 "owner loyalty" appears again. Actual price of this pre-owned van? $27,650, and it's not even certified! MSRP PRICING ONLY- We all know there are rebates, incentives and discounts on almost every car on the market, yet dealers think they can get away with just putting the MSRP on their website with no discounts. This isn’t the old days! Customers can research the Internet to find out the current incentives and rebates being offered by the manufacturer. Dealers that only put the MSRP of the vehicle on their websites with no discount at all must be hiding something. This practice requires you to put your information online and constantly be contacted by the dealership. You then receive their best price via email, but may not remember to check the website for disclosures about their discounted pricing. When you get to the showroom… SURPRISE! The price is increasing by the minute due to incentives you do not qualify for! Bait & Switch - Advertise a vehicle at a really low price, and then tell the customer when they get to the dealership that the advertised price is AFTER thousands of dollars cash down or trade equity. Out the door pricing? - When you ask for an "out the door" price you want to know how much will I be writing a check for. Some dealers will give you an "out the door" price and when you get to the dealership you will find that the price you were quoted doesn't include tax, tag and fees. "That one was just sold" - If an offer seems too good to be true, it usually is. The super low price lures in shoppers who are told that they "just missed" that deal of a lifetime, but here's another similar vehicle that is only a few thousand dollars more. 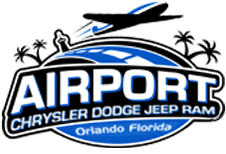 At Airport Chrysler Dodge Jeep in Orlando, we have become one of the fastest growing dealerships in America by stocking the area's largest selection of new Chrysler, Dodge and Jeep vehicles and pricing them as low as we can. That's why we get customers from all over the country who realize that we have the vehicle that they're looking for at the absolute BEST PRICE available. The price on the website is the price of the vehicle. No hassles, no gimmicks, just the lowest possible prices and best service available. We'll treat you right and give you a great deal.